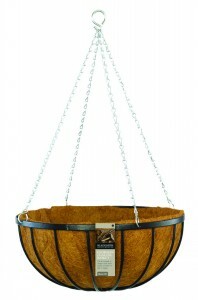 Traditional wrought iron effect hanging basket with a 3 point black coated chain with 'S' hook attachment. Complete with coco liner. Made from black coated steel rod and flat bar with a crackle finish.